The festival of playing colours, Holi is almost here and we can sense the excitement around already. While today is Holika Dahan, everyone will be indulging in a messy play of colours and water tomorrow. Children especially have already started getting out their pichkaris, water balloons and colours, enjoying splashing their friends already. But many times we also see people involving stray animals or their pets in the festival. It is not just the kids but even elders take gulaal and throw it on the stray dogs. It may seem fun but it is far from any fun to these furry animals. Not just the dogs and cats, all kinds of animals should be kept away from the colours. Holi 2019: How NOT to Celebrate Holi This Year – A Guide. If you look around closely, around the time of Holi, the stray dogs are finding shelter from these celebrations. The colours have a toxic effect on their skin and while you can go home and take a bath, be clean, the animals, unfortunately, don't have anyone to take care of them later. The colours stay on their fur for a prolonged time. It is sad that animals are subjected to our celebrations. 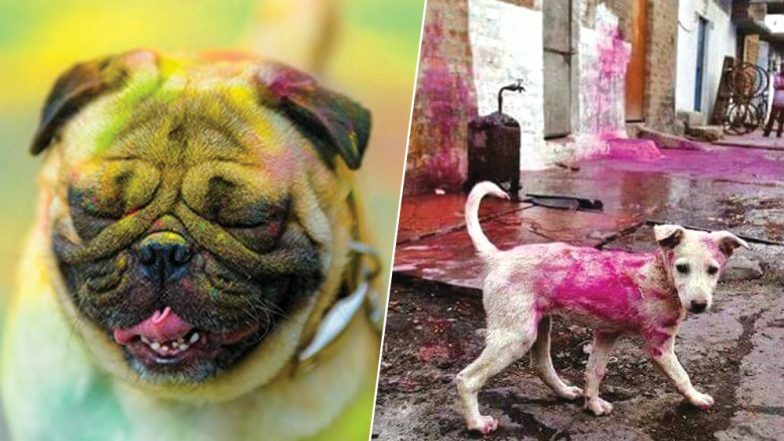 Not just the strays, even pet dogs or cats shouldn't be subjected to Holi colours. Holi 2019: Here are 6 DIY Natural Holi Colours That Are Safe and Healthy for the Skin. Most colours have chemicals which can cause skin allergies. The animals will be left scratching and it may cause further skin rashes to them. If the colours happen to enter the eyes of these animals it can even cause in losing their vision. An eye is definitely a vital organ and it can cause a prolonged irritation if the colours enter their eyes. If the colours enter the respiratory tract of the animals, it can cause disorders and breathing problems. The only way animals clean themselves of the colours is by licking themselves. The toxins from the colours thus enter their body and it acts as a slow poison on them. The stray animals do not have access to food and water easily and thus drink the roadside water which is smeared in colour. This is another way in which the colours enter their bodies. All of the above can result in major irritation for the animals and it can drive the dog especially to despise the humans. They then get irritated and end up biting people. So while it is a celebratory time for everyone, we urge you to keep your balloons, colours and pichkaris to yourselves and your friends. Please do not involve your pets or stray animals in any kind of celebration. Have a safe and happy Holi!